Welcome to another installment of If My Book, the Monkeybicycle feature in which authors shed light on their recently released books by comparing them to weird things. This week Jodi Paloni writes about her debut story collection, They Could Live with Themselves, out now from Press 53. . If They Could Live With Themselves were an architectural detail, it’d be a twelve-paned window sash, chipped paint, hinged on the north-facing side of a faded yellow barn. One of the panes has been busted out by a snowball and patched with cardboard and duct tape. If They Could Live With Themselves were the outfit on a sixteen-year old girl headed out to the movies on a spring evening, it would be a cashmere sweater—grey, circa 1978, moth holes on the left elbow—borrowed last minute from her boyfriend’s father and pulled over a satin slip dress the color of bubble gum and trimmed with white lace. She’ll kick off her black patent leather flats when the theatre grows dark and tuck her feet under her bottom as she leans into her boyfriend’s shoulder, liking the way the silky fabric feels on her bare calves. During the scary scenes, she’ll pick at the frayed ribbon off a box of Valentine chocolates that she tied in her hair. If They Could Live With Themselves were a garden, it would be a patch of organic heirloom tomatoes overrun with catnip, tiny purple flowers loaded down with honey makers from the hermit beekeeper on the other side of the river who despises the new-age homesteaders whose gardens his bees love. If They Could Live With Themselves were an artisanal cider, it would be called something like Twisted Teacher or Little Sister Blues, a bone-dry bubbly pressed from late-autumn eating apples, tart and funky, best served at room temperature paired with wild turkey chili garnished with grated cheddar and chopped scallions served at a small-town supper. If They Could Live With Themselves were a man wearing a Halloween costume, he would be masked in a floppy green rubber witch face, donned in a flour sack dress with an overstuffed bosom that was cinched by a leather belt because he was expected to participate and be funny. His hat would be black, broad-brimmed, and pointed in the traditional sense, but he’d wear beige support hose and white Nike basketball sneakers, size eleven, for the irony. If They Could Live With Themselves was a song on the radio, it would be one the recently divorced late-night DJ played when everyone else was asleep except for the insomniac, a widow all these years, who called in and requested her late husband’s favorite big band hit when she was really just listening for a voice on the other end of the line. 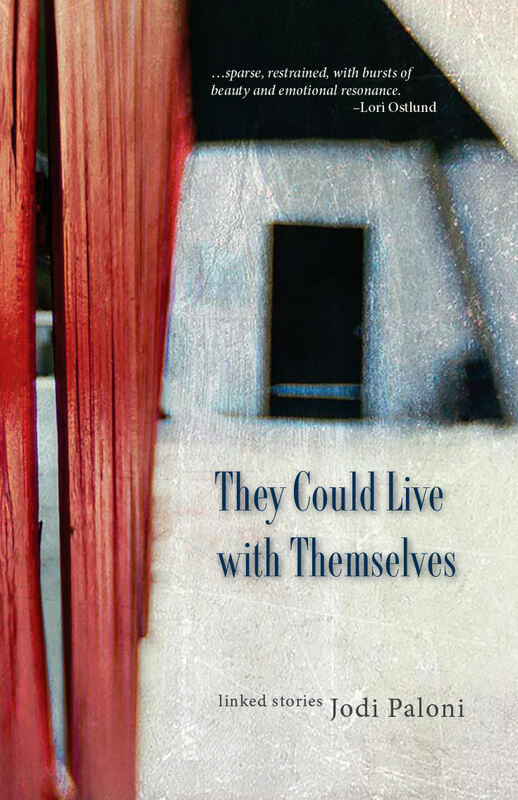 Jodi Paloni’s debut story collection, They Could Live With Themselves, was a runner up in the 2015 Press 53 Award for Short Fiction and published by Press 53. Her stories appear in print and online. She drives back and forth between Maine and Vermont, two places where she can’t bear not to live. She makes Word and Image art. Connect on Facebook, Twitter at @JodiPaloni, and visit her website, www.jodipaloni.com.